So it has been an eventful Christmas – New Year’s Holiday here at the Weathers household. Things didn’t work out how we planned, but we’re hanging in there, and the ride has ultimately turned out fun after all. Every year, Melinda and I both take off the week of Christmas and the week of New Year’s Day. This year our vacation started after we both left work on Friday, December 19. Saturday, we enjoyed our first day of the break by taking Doobie to the dog park and then doing some last minute Christmas shopping at Fry’s Electronics store followed by some tasty gluten-free pizza at a Pepperoni’s Pizza in Duluth. Also, on Saturday, we finally managed to get salt delivered for our house’s water filtering system. It turned out that thanks to a tripped wire, our system had not run through its cycle for several months. So in addition to filling up the salt in the tank, the tech guy set the system to run that night. Despite being on vacation, we couldn’t quite shake the habit of getting up early for work, so Melinda and I woke up around eight on Sunday. We went downstairs, and I made us some breakfast and coffee at which point it became clear that the initial run of our water filter system after months of disuse had left the water in our pipes tasting funny. In fact, the taste was unpleasant enough that we poured out our coffees. This weekend has been a tiring adventure! Our story begins on Saturday morning. While my wife Melinda was practicing her violin, I sat at our dining room table happily working on an Euler problem on my MacBook Pro when a flash of movement caught my attention through our dining room window. I saw what appeared to be a dog dashing into my neighbor’s yard. It looked about the size and build of one of her dogs, but her cars were not in her driveway. My experience with the death of my dog Bodie had me fearful for the safety of this dog, so I went outside to take a look. When I stepped out onto my driveway, I found a brownish red pit bull peering back at me from around the corner of my neighbor’s neighbor’s yard. He looked very rigid like he was considering whether he should dash towards me or dash away as fast as possible. He appeared to be wearing a black collar. Hoping that he had a tag with some identification on him, I stepped back inside my house to grab one of our spare leashes and a dog treat. I then headed back outside and saw that the dog was gone. However, I looked down my street and saw him again just as he dashed into a neighboring cul-de-sac. I gave chase to my four-legged quarry and upon arriving at the mouth of the cul-de-sac, I saw to my relief that the dog had not gone very far. Dashing around between two houses, he seemed to frolic in his freedom while hiking his leg every few feet. I quickly cut the distance that separated us and then cautiously approached the dog who was now staring curiously at me. I came within fifteen to twenty feet from him and then extended my hand while employing my best friendly-person-calling-a-dog voice to beckoned him near me. With just a hint of hesitation, he timidly approached me. Once he drew near enough and sniffed my hand, I petted him gently on the head and offered him the treat. He sat for me in a docile fashion and sniffed the treat with interest. While he examined this tasty morsel, I managed to calmly grab his collar and hook my leash to it. The dog then took the treat, sampled it and spit it out. So much for the tastiness of the treat, but I was relieved that I had the dog securely on my leash, and he seemed to trust me. I took a moment to examine his collar and found to my dismay that he had no tag. My dog Doobie is a skittish dog and he is rather nervous around strangers and other dogs. Almost any time, he finds himself in the presence of another dog, he growls or shows other signs of aggression. For some time, we have been meaning to enroll Doobie in training to correct this behavior, but currently, he simply cannot be introduced to other dogs. Unfortunately, that meant that I could not bring this pit bull ‘Dog’ into the house no matter how friendly he seemed to me. On top of that, my wife and I had plans to have lunch with some of our friends and the agreed upon hour of meeting was drawing nigh. After some discussion with my wife, I took ‘Dog’ for a little trip to our local vet while she left to meet our friends for lunch. Much to my surprise, ‘Dog’ was very well-behaved on the trip. He was a perfect gentleman, sitting calmly and never whining in fear like our dog Doobie and every other dog that I’ve owned. This made the whole trip easier as my mind was already starting to worry about what I was going to do with this dog if the vet couldn’t find a chip on him. We arrived at the vet, and ‘Dog’ bolted out of the car in full stride, his powerful muscles forcing me to strain to avoid getting knocked onto the ground. When we got inside, I made sure that ‘Dog’ did not come into contact with any of the other animals waiting in the lobby as I had no idea what his disposition towards them might be. Soon after arrival, we were taken into an examination room where ‘Dog’ proceeded to sit between my legs and let me pet him, instinctively clinging to me as his new protector. The doctor came into see us and she checked him over. Sadly, ‘Dog’ had no chip to help us identify a possible owner, but on the plus side, he seemed to be in great health and the vet’s examination revealed what appeared to be the remains of a vaccination tag, perhaps ripped off during an escape from his owner’s yard. The vet and I agreed that based upon the dog’s health, disposition, and apparently trained behavior (responding to commands such as sit, come, and off), this little guy was probably somebody’s pet and that some owner was probably out there heartbroken and trying to find ‘Dog’. The vet gave me some numbers and URLs for local rescue groups that might be able to assist me in fostering ‘Dog’ while searching for his owner which I stressed would be a necessity thanks to the situation with Doobie at home. The vet told me that there was the possibility of boarding him there, but that it would run $175 for a medical clearance of him and then $31 a day. She also recommended that I wait at least until Monday sense she thought it likely that I could find the owner over the weekend. I was worried that we might never find the owner, but I decided to go with the vet’s advice and hoped Melinda and I can figure out something to do with ‘Dog’ for the weekend. When I left the vet’s office, I found out how frazzled I had been over the whole experience because I realized to my horror that I had somehow locked my car and left the keys running! Thankfully, I had also left the passenger side door unlocked and so I didn’t have to call a locksmith or my wife. When I got back home, I set about trying to call all the local vets in hopes that one of them might have a patient matching the dog’s description. Unfortunately, it was Saturday afternoon and pretty much all the vets were closed for the weekend. To make matters worse, I was growing hungry and was confined to do all my calls and internet research outside because ‘Dog’ began to freak out when left by himself in the backyard. Also, one experiment with leaving him out there unattended resulted in a scary incident, where he dug a hole under my fence and I find him galloping around in my front yard. Fortunately, he happily came back to me when I called to him. After that near disaster, I searched through my garage for Bodie’s old long leash and stake and set the stake up in the middle of my backyard so that ‘Dog’ had a lot of freedom to run and explore without the freedom to escape and give me a heart attack. It seemed like it took forever for my wife to return. In the mean time, my research showed me that I was facing a long battle should we not locate the dog’s owner. 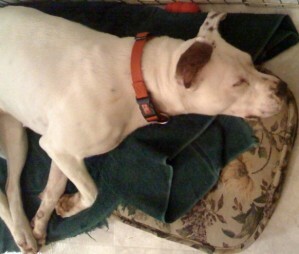 Pit bulls have an unwarranted bad reputation and as a result are very hard to place with rescue organizations. The only organization that seemed likely to be able to help was a pit bull specific organization that sent me an auto-reply and detailed how they were currently full with long waits. Also, they advised that taking a pit bull to an animal shelter was a death sentence in Georgia which my vet had already warned me about in Cobb county. This had already never been an option for me because the chances are bad for almost any animal that winds up in a shelter. But this information strengthened my resolve that we would do whatever was necessary to keep this dog out of a shelter. When my wife got home, I took the opportunity to reheat some left over pasta and then set about printing up some ‘DOG FOUND’ fliers. Then, while my wife stayed at home to keep an eye on ‘Dog’, I drove around the surrounding neighborhoods and taped fliers to strategic locations. My vet and animal control had all given me advise that I not share too much information in the fliers because there are people who answer these ads falsely so that they can take the dogs and use them in dog fighting rings. By the time I returned home, my wife had spent an hour watching the dog and learned that he simply would not stop barking obnoxiously when left outside confined to our backyard. He seemed to have latched on to me as a life raft, and any time that I went away from him, he quickly descended into hysteria. This spelled the end of our vague plans to leave him outside for the evening which is just as well because I could have never slept knowing that he may have broken free from his leash to escape our fence. We decided that we would need to board him with a vet that I had called earlier in the day that remained open until 7pm. Unfortunately, my timing was bad and the vet had already left for the day despite the clinic being open for fifteen more minutes at the time of my call. Without a vet to administer vaccinations, they could not admit ‘Dog’ for boarding. The attendant suggested I try PetsMart as they had a clinic with later hours as well as a Pet Hotel. I quickly found that it was too late for PetsMart to schedule anything as well, but they suggested I look in the yellow pages for kennels as some kennels can do vaccinations on site. I spent thirty to forty minutes sitting outside with ‘Dog’, my laptop, and the yellow pages in the cold darkness of the early evening calling every kennel and finding the same stories: either the kennel was closed for the night or they could not take an undocumented dog into their care. In desperation, we tried one last measure. We searched through our cluttered hall closet and dragged out Bodie’s old crate which we used for our first year with him better stopped using once we got Doobie. We parked our Honda Fit outside in the drive way and after closing the garage door, we set up the dog crate inside with a small towel and large raw hide bone. We then led dog inside, lured him into the crate with a treat, and shut him inside. After turning out the lights and shutting the door leading inside the house, we crept around on tip toes waiting for the inevitable howling, whimpering, or barking to commence. Instead, we found to our joyful surprise that ‘Dog’ must have had experience with crates because we continued to experience nothing but blessed silence from the garage. After what had been a long and awful day, I was hungry and tired. We went out for some Mexican and made plans to “board” ourselves at a Holiday Inn Express should ‘Dog’ find his voice when we returned home. However, our fears were without warrant for ‘Dog’ was quiet throughout the night. After a good night’s rest, I got up early the next morning and came downstairs with Doobie to take care of feeding him and letting him outside before preparing myself to once more deal with ‘Dog’. After sufficiently preparing the place by gating Doobie upstairs, I let ‘Dog’ out of the crate and was thankful to find that he had had no accidents during the night. He was very happy to see me and to be free. He still seemed nervous though and never wanted to lose sight of me. That morning we tried something different. With Doobie confined upstairs, I cautiously allowed ‘Dog’ to enter the house. Melinda had been afraid that ‘Dog’ who was constantly hiking his leg to mark territory outside would do likewise inside our house. I thought otherwise though because he showed signs of being well-trained during the trip to the vet and had never made a mess in the car or at the vet. When I let ‘Dog’ inside and dropped his leash, he began to feverishly sniff the carpet sensing Doobie all around, but thankfully my judgement was proved correct as all he did was sniff. Eventually after several minutes of this behavior, he settled down and came to sit beside me as I worked on my laptop trying to found other organizations that might help us foster him for the long term should it be required. Eventually, Melinda came downstairs and we had coffee together, but Doobie began to whine incessantly and it proved too much to handle. So I took ‘Dog’ for a walk around the neighborhood and then reluctantly confined him to the crate once again. This time we could hear some rather soft and pathetic howls echoing ghostlike from the garage, but we steeled ourselves against them as we prepared for round two of flier posting. We printed out some improved fliers and then Melinda, Doobie, and I took a long walk through out greater neighborhood putting up more fliers, secretly hoping to find that “LOST DOG” fliers had been magically posted during the night. Instead, we returned well-walked, but empty handed. I was trying to keep my hopes up and focused on my plans for Monday morning where I hoped that the calls to local vets would yield some definitive clue to the dog’s owner. In the mean time, I could not stand the idea of ‘Dog’ remaining confined to the crate, so I let him back out and then the two us made camp on my back patio. ‘Dog’ sat by my side seeking the comfort of my petting while I tried to focus on my computer to take my mind off the sobering problem of keeping this dog for any length of time in such an ill-prepared setting. Melinda sat inside on her MacBook and we kept in touch through the early afternoon via iChat. I found it hard to concentrate on anything other than ‘Dog’. I logged onto Facebook and updated my status to reflect my predicament. I thought about how it might be nice to get out a blanket and lay on the grass with ‘Dog’ beside me and a good book to read. I was startled out of my meditations by the ringing of my cellphone. I looked at the number and did not recognize it. Did I dare to hope!? I answered the phone and heard a man’s voice on the other end. He was asking if I was the person who had found a male red dog. I said that I was and asked him what kind of dog he was trying to find. The man described a red male pit bull and soon we both found ourselves laughing happily that we had found each other through my fliers. The man identified the collar that ‘Dog’ had been wearing along with correctly detailing the missing tag and the fact that ‘Dog’ was not neutered. He revealed that ‘Dog’ was in fact named ‘Ramses’ and as I turned to the dog and called him ‘Ramses’, I could see a different light spark in his eyes as he recognized his name. I turned to look at the sliding glass patio door to find my wife and Doobie on the other side. She was staring excitedly inquiring with her eyes whether we had fond the owner. I gave her a hearty thumbs up and proceeded to tell the owner how to get to our house. After I got off the phone, I realized that the powerful wind had forcefully knocked one of the doors to my fence wide open. Despite the fact that Ramses was on a leash tied to as stake in the ground, I feared leaving the gate open. I ran over to secure the gate, but as I arrived the wind knocked it wide again before I could adjust it. At that exact moment, I witnessed Ramses flying through the gate without his collar. With no time to process how this could have happened, called out “Ramses! Here boy! Here!” and much to my relief, Ramses happily came back to me and allowed me to grab him and pick him up. I called to my wife and prayed that Ramses would stay still in my arms and not get away while I had no means of securing him. To lose the dog now while his owner was on his way would be the ultimate in ironic injustice. Fortunately, Melinda arrived in time and dashed off to get Bodie’s old collar. It fit Ramses well and allowed me to secure him to a leash once again. I found his old black leather collar lying in the grass ripped from the strength of Ramses’ excited dash to follow when I had run to secure the gate. Shortly thereafter, Ramses’ master arrived and you could instantly tell that this was his ‘daddy’! Ramses nearly pulled my arm out as his ran excitedly to the man who had just stepped out of his car in my drive way. Ramses’ owner was laughing and happy to his wayward dog, but you could also see that he was holding back tears. It seems that the man had been in Texas on Saturday for a job interview and his girlfriend had been watching his house and Ramses for him. Sometime early Saturday morning, Ramses had escaped from his backyard and Sunday morning the man had been frantically driving around looking for his dog. Thanks to the fliers that Melinda and I had posted, he was able to find us and be reunited with his boy. It was a rough two days, but a happy ending like this made it all worth while!